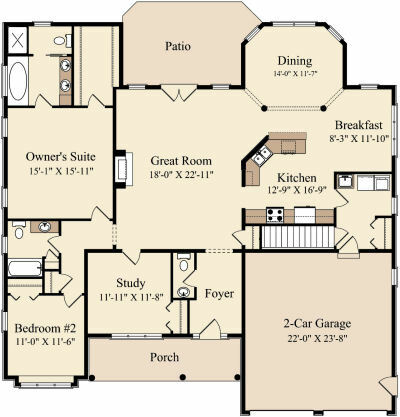 When we first looked at our house, my only concern was it felt like there were too many eating areas. With just two of us, I wasn’t sure how we would use a kitchen bar, breakfast room, and dining area. Here is our floor plan, so you have a point of reference for the multiple eating areas all within very close proximity of each other. But, we loved the house and since it was my only hesitation, it was nearly a forgotten thought shortly after I said it. We ended up purchasing a new dining room set, because neither Bob nor I had one that we felt suited our new home. Bob did have a small table and set of chairs that we thought could work in the Breakfast Room, as well as an antique buffet. So, we moved in and set up the room with what we had. 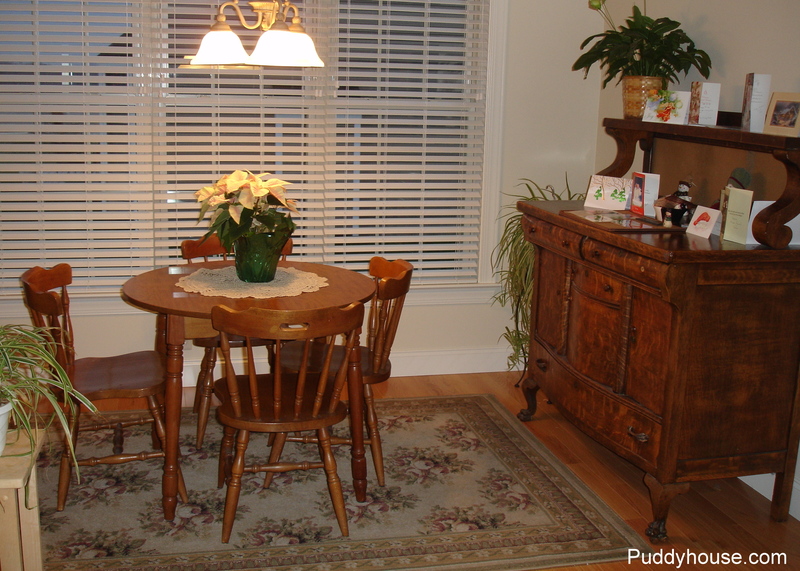 This was the state of our Breakfast Room around Christmas time 2007, just weeks after we moved in. Bob and I actually used the small table quite often to eat, until we got stools for the kitchen bar. Once we purchased our bar stools, eating in the Breakfast Room, even if it was for dinner, became a thing of the past. I kept picturing the room as more of a sitting/sun room. But, with the rest of our decor and style, I knew I couldn’t furnish it with really light and airy sunroom type furniture. Fortunately, I make it a habit of popping into Goodwill and Salvation Army, which are the common thrift stores in our area. One day at lunch, I decided to go to Salvation Army and lucked into 50% off furniture day. I spotted two of these chairs. I liked the chairs, and since they were 50% off, it made them only $25 each. I wasn’t positive that Bob would like them, so I snapped a cell phone picture and texted it to him. I didn’t have time to wait for a response, so I went back to work. He checked out the picture and decided they were good. So, I rushed back to the store after work and snatched up the two chairs. I had never done any reupholstering with tufting, but I figured I would give it a try. I offset the cost by selling the old table and chair set on craigslist. With cash in hand, I was able to purchase the supplies I needed: fabric, a button kit and trim, and still have some money left. 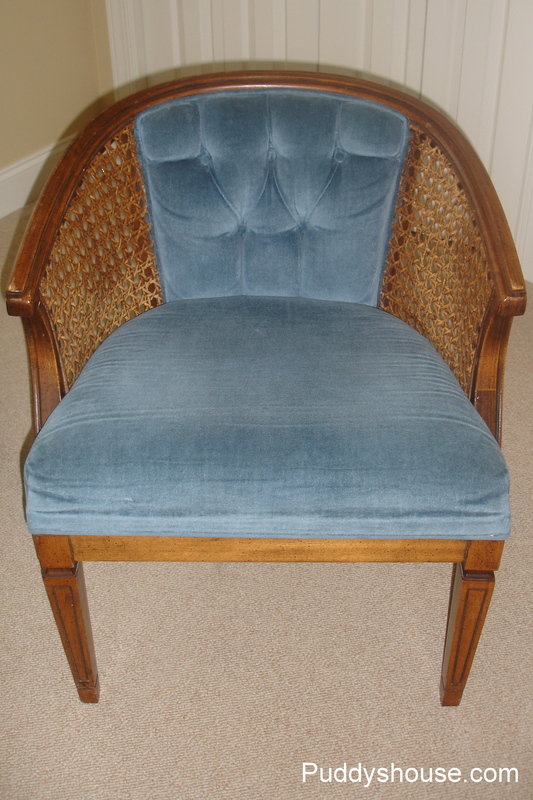 I knew the room needed something else besides the two chairs, so I kept searching the thrift stores. 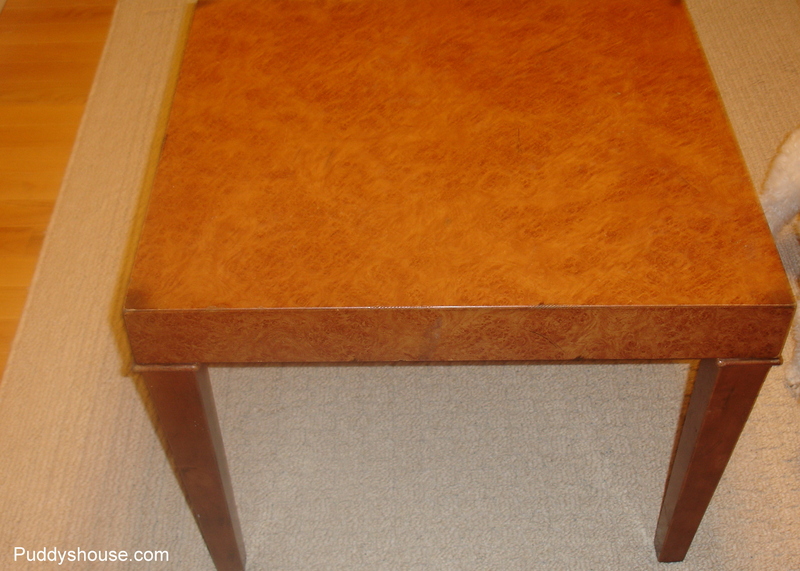 One Saturday, as I shopped with my thrifting friend, Judie, I spotted a $20 side table. It was ugly, but it had potential, and it matched the measurements I was looking for, except it was a bit tall. When Bob saw the table sitting in our Breakfast Room, he really thought I was crazy!! I explained my plan to convert it into an ottoman…he still doubted me, but for $20, agreed it was worth a try. I needed his help though, because at the time I was not using power tools, especially not a saw. I gave him the measurements I was looking for and he sawed off the bottom portion of the legs. I purchased foam and attached it to the top of the table and secured it with batting by stapling it underneath. 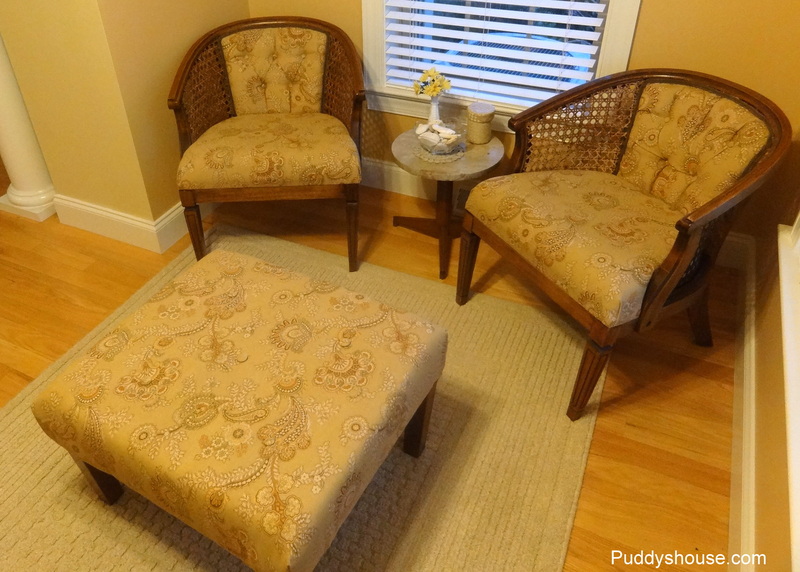 I used the same method for the fabric and Bob had drilled holes in the table top so that I could use them as my guide for the buttons for the ottoman. That may have been the most challenging part, getting the needle through the thick foam and securing the buttons in place, but Bob helped and we made it work. Today, our Breakfast Room is more of a Sitting Room, and it gets so much more use. The sunlight streams in the room in the morning and its a great place to sit and read, chat, or just relax. And, the wonderful sunlight is also the reason I tried taking twilight pictures of the room. Its not the best, but it gives you a truer picture of the colors. The bright morning light washed out the pictures too much. The side table has a marble top and wooden legs, and was a later addition to the room when I found it at a yard sale for few dollars. Anyone else have successful thrifting and repurposing projects to share? How about rooms that were transformed into a different use? This makes me want to start visiting Salvation Army again but for furnishings instead of clothes! The chairs are fantastic!